The indoor urban aquaponics farm at FoodChain in Lexington, Ky.
LEXINGTON, Ky. — Smithtown Seafood’s fish platter is a sight to behold and a delight to eat. The golden-fried tilapia is as local as fish can get — hatched and raised just feet away at an indoor aquaponics farm. In fact, FoodChain, as the farm is known, also raises the microgreens and herbs in the fish sauce and the lettuce that cradles the fish. Nothing goes better with the tilapia plate than a mug of Deliberation Amber from West Sixth Brewing, the craft brewery that brought them all together. In 2011, Blue State Digital cofounder Ben Self and several friends decided to make craft beer. They purchased the former Rainbo Bread Factory at West Sixth and Jefferson in Lexington’s Northside neighborhood. Built in the 1890s, the 90,000-square-foot building had been a commercial bakery for a century, but had stood vacant for several years. The budding brewers saw a jewel in the rough — a building where they could brew beer and reinvigorate the neighborhood. They dubbed the building the Bread Box, and the first tenant after West Sixth was FoodChain, the brainchild of Becca Self, Ben’s wife. The Lexington natives and high school sweethearts are both 2000 graduates of MIT, where Ben studied computer science and Becca majored in architecture. Over time, they have been joined in the former factory by Smithtown Seafood, a coop bicycle shop, a coffee roaster, a boutique bourbon distiller, a small press, a collective of artists’ studios, and an incubator for nonprofit enterprises. One corner serves as practice space for ROCK, the Rollergirls of Central Kentucky. It makes for a pretty interesting crowd at the stools and tables of West Sixth’s taproom, where 15-20 varieties are on tap, including its flagship IPA. As the anchor of the Bread Box, West Sixth also serves as the figurative front door of the complex. The taproom is open daily, and the inner sanctum of the barrel room, which serves small-batch and barrel-aged brews, is open on weekends. The brewery also sponsors a running club, a bicycle club, free yoga instruction, and occasional science lectures. FoodChain also opens to the public for a Saturday afternoon tour of what they claim is Kentucky’s first indoor urban aquaponics farm. Becca conceived it as a demonstration project of year-round food production without soil or natural light. The long, low expanse of the bakery’s former oven room is brightly lit with Inda-Gro induction lamps hanging above greenery sprouting in perlite-filled rafts floating atop shallow tanks of water. The lights are kept deliberately low at the end of the room where fast-swimming fish roil the waters of tall tanks. 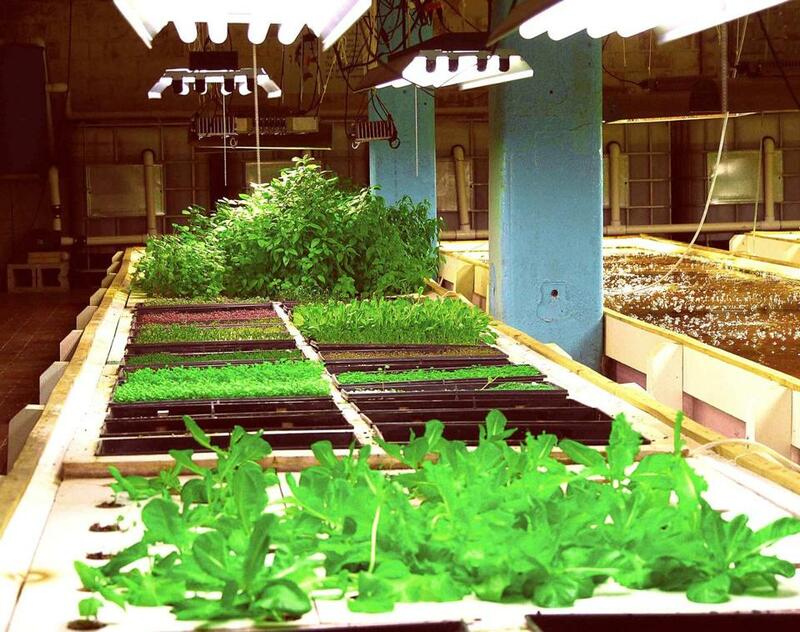 With technical assistance from Kentucky State University, FoodChain has just passed its third anniversary of producing leafy greens, herbs, microgreens, and edible shoots along with a steady supply of tilapia. The operation is surprisingly straightforward. “Basically, we feed the fish and everything else just happens naturally,” Becca explains. “The fish waste is converted into fertilizer to feed the plants, and the plants clean the water to circulate back to the fish.” Becca worked with Kentucky State to develop fish food based on spent grain from West Sixth’s brewing to provide nearly half the necessary nutrients. The farm even breeds its own tilapia fingerlings, letting the females brood the eggs in their mouths for three weeks before hatching. At three to four months, the fingerlings are big enough to go into the large production tanks. At six months, they reach about a pound and a half —optimal for a single restaurant serving. FoodChain has six 250-gallon tanks, each of which holds 80 to 100 fish. A different tank is harvested each Friday, producing about 20 fish for the specials at Smithtown Seafood. The restaurant is owned by celebrity chef Ouita Michel, a longtime champion of Kentucky growers. At the Bread Box, chef de cuisine Jonathan Sanning serves often sophisticated takeout food using ultra-local ingredients, whether it’s the beef in the burgers, the fish, or the salad greens. Because Smithtown shares the bakery’s former packaging room with the West Sixth tap room, diners can walk their orders over to the tap room tables to eat. Sanning favors Asian accents, and FoodChain obliges by custom-growing some herbs and sprouts. His “Tilapia Singapore” is served with spicy-sweet pickled vegetables and with microgreens, mint, cilantro, and Thai basil from FoodChain. When FoodChain staff walk the freshly harvested tilapia through the door on Fridays, Sanning posts the tilapia plates of the week on Facebook. Smithtown usually runs out of tilapia over the weekend, but diners can take comfort that more are growing to size in the next room. The Bread Box address is 501 West Sixth St., Lexington, Ky.
West Sixth Brewing 859-705-0915, www.westsixth.com. Open Sun-Wed 11 a.m.-10 p.m., Thu. 11 a.m.-11 p.m., Fri-Sat 11 a.m.-midnight. FoodChain 859-428-8380, foodchainlex.org. Tours Sat 1-2 p.m., adults $10, children $5. Smithtown Seafood 859-303-4100, www.smithtownseafood.com. Open Sun-Wed 11 a.m.-9 p.m., Thu-Sat 11 a.m.-10 p.m., burgers and sandwiches $5-$13, platters $13-$20.